Omni Cable 20/8 Multi-conductor computer cable has 0.032-Inch gray PVC jacket to withstand harsh environmental conditions. The tinned copper cable has 0.013-Inch PVC insulation that resists electrical leakage and offers protection against environmental threats. It has voltage rating of 300-Volts. This cable has outside diameter of 0.248-Inch. 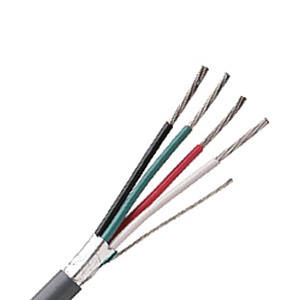 It withstands temperature rating of 80 deg C. Cable is UL listed and meets NEC article 800 standards.